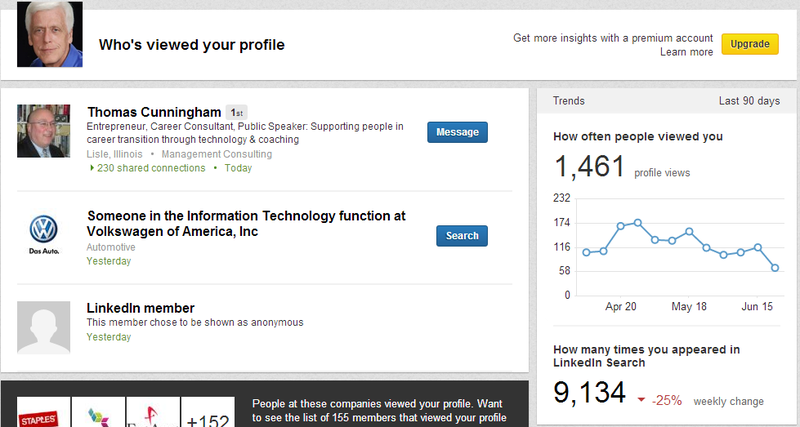 Do You Have the New LinkedIn’s “Who’s Viewed Your Profile”? is a link when you hover your mouse over the words Who’s Viewed Your Profile. The are two number and phrases there. The top number is the number of people who have actually viewed you profile. job search you want that number to be much higher. up in search results 25 times today. When you hover your mouse and click on the link will take you to the “Who’s Viewed Your Profile” homepage. listings depending upon the privacy settings of the viewer. b) Anonymous profile characteristics such as industry and title Note: Selecting this option will disable Profile Stats. c) You will be totally anonymous Note: Selecting this option will disable Profile Stats. How many times you appeared in LinkedIn Search. how well you have crafted your LinkedIn headline to attract attention. « How do you like the New LinkedIn Profile?